Hint: try being white and wealthy, kids! 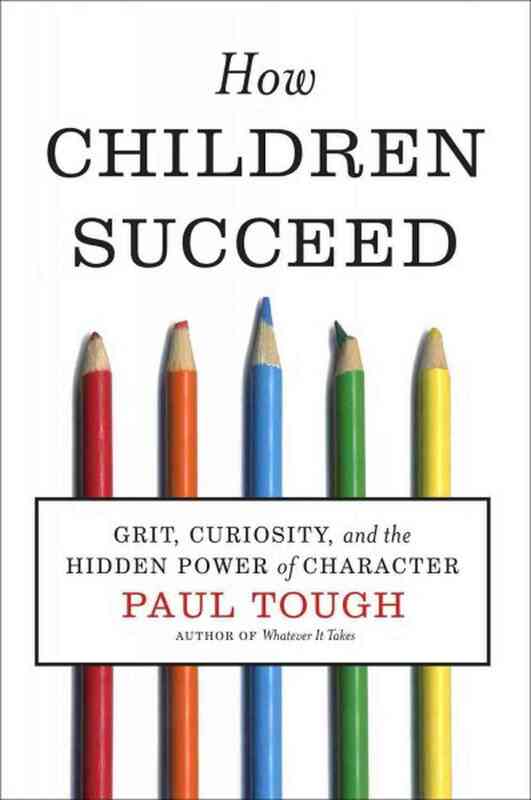 Paul Tough’s How Children Succeed: Grit, Curiosity and the Hidden Power of Character is another in a long line of books which tries to determine how we can better serve “underperforming” children—specifically children in poverty and children of color. Tough posits a fairly new approach to this social problem: character. He draws a distinction between cognitive skills, which are most often expressed through academic ability, and noncognitive skills like perseverance, conscientiousness, and eagerness to learn. Over the course of some 200 pages, Tough explores how and why these noncognitive skills develop from a variety of approaches—interviews with students and educators, positive psychological research, studies of rats’ mothering habits and biological stress responses. The context of the book, though, is as important to my reading of How Children Succeed as its actual content. This is a book I see around my workplace often. It was, in fact, loaned to me by a coworker. And last year, while I was on fellowship as an Education Pioneers Analyst Fellow, some of my cohort read it in a book study. I work in the ed reform movement (something I have deeply ambivalent feelings about), and this book is fast becoming part of the ed reform lingo. It’s a natural fit. This book (and by extension its writer) comes from the same place as my TFA alum and Broad resident coworkers: this is a book written by a deeply privileged person who wants to fix education. That’s a noble goal. But the problem I see over and over in the ed reform movement is that these privileged people cannot see past their privilege, and so the ways they want to fix education continually read to me as shallow and ineffective. Tough’s book is a great example of this tension. Tough grew up middle class, white, cisgender and male. At several points in the book, he discusses his decision to drop out of Columbia University as a tortured eighteen year old. The fateful dropout decision is not predicated on some external forces (a financial crisis or having to return home to take care of a relative in a tight spot) but on a vague notion that he wants to “try something that’s new”. Tough ends up bicycling halfway across the country, then returns to college only to drop out a second time. So, this is the author’s background. His research and reporting for the book takes him to the South Side of Chicago where he tries to understand the lives of struggling high schoolers. He seems to see these kids’ struggles mostly as a result of two things: the high levels of stress they’ve encountered in their short, violent, impoverished lives and the apparent absence of secure attachments to caregivers. Tough uses research on the HPA axis and biological effects of stress and research on attachment theory to largely explain why and how these kids haven’t yet developed the cognitive skills needed to get them to and through college. And while both of those things may play some small part in their current trajectory I believe he severely overstates the effects of both. Let me tell you where I’m coming from. I am white, but I grew up poor and queer and struggling with my gender in a small, conservative town in Texas. My parents were both trapped in substance abuse. I was alternately neglected and abused by them, and as such, never developed a secure attachment to either. I also excelled in school (though I was a troublemaker). I got out—got into college, graduated, and then got a doctorate. I am what educational psychologists call “resilient”. I have what Tough calls character in spades. My sister is less resilient. The major difference between my sister and I? She is dealing with a different level of mental health issues than I am. She has a learning disability that was never diagnosed. She didn’t excel in school. In a word, she didn’t look like she could pass as middle class. Tough makes the case that if poor kids have a positive adult role model to help them develop ‘character’ that they can ‘succeed’. He never stops to consider that what he has deemed ‘character’ is a very white middle-class idea of character. It is deeply steeped in the Protestant Work Ethic, for instance, and it may be that poor kids of color are developing a different kind of character, a set of noncognitive skills acutely attuned to the context in which they live. My avoidant attachment to my parents growing up, for instance, was a totally appropriate way of managing my relationship to unstable and unreliable caregivers. The same with his unspoken assumptions about what success looks like—this is a white, middle class idea of success. When Tough abstracts character and success from the context these people live in, divorcing it so neatly from the structural and institutional oppression caused by racism and classism, he presents the answer to our ‘education system’s failures’ as very simple. While reading the book, the message I got was that all we have to do is train poor black kids to act like well-off white kids and they’ll do just fine. The fact that this strips them of their culture, that it separates them from their families, that faking-it-til-you-make-it is another kind of colorblindness is not addressed. And I can say from my personal experience that I faked-it-til-I-made-it. That’s exactly how I got to and through both college and graduate school. And now I’m upwardly mobile but I’m still a kid who grew up poor. Navigating social class has only gotten harder as I’ve moved up the social ladder. I can’t imagine what it would be to be black or Latino on top of it and to have my marginalization so clearly written on my skin. The heart of my issue with the ed reform movement, and this is something that Tough’s book falls prey to, is that it doesn’t see the American education system for what it really is. Today, the American Dream is synonymous with educational attainment. The problem is that the American Dream was never meant to apply to most of America. We’ve constructed our education system to explicitly create class divisions along racial lines. Our education system is not failing—it’s achieving exactly what it’s built to do. There’s no reforming it. No amount of character classes in charter schools attracting smart but impoverished kids of color is going to change that. The ed reform movement is a predominantly white, middle class movement and as such it is a movement that makes certain assumptions about the fairness and good faith of the institution of education as it currently exists that are false. I succeeded in life because I am privileged enough to blend in with the privileged ruling class. I’m white. I’m academically gifted. I was an avoidantly attached enough kid that I was fully comfortable leaving behind my broken family. I worked very hard to lose my scraggly Texan accent when I arrived at college. The noncognitive skills that got me where I am today are largely those that let me forcibly blend into an unfamiliar environment ripe with opportunity. I am a fluke. I am the exception. And it’s not my kid sister’s fault or the poor black kid on the South Side’s fault that they didn’t make it. For other people it’s not so simple as just developing a better character, and on every page I felt insulted at the implication that Tough felt he’d found the silver bullet in this. There are no silver bullets. There’s no reform. The only thing that will work is rebuilding the system from the ground up. There’s no improving an inherently racist and classist institution—there’s only replacing it. This entry was posted in 2 stars, Book Review and tagged 2 stars, book review, ed reform, education, How Children Succeed, Paul Tough, social justice by brsanders. Bookmark the permalink. Thanks for this, B. I love your thoughts.